In a discussion with several other social justice activists, we were trying to decide why UWGLA's well paid political consultants didn't have the good sense to at least change the precise order of the candidates that they and their fellow special interest group, the CCSA, feature on their propaganda pieces. UWGLA could argue, unconvincingly, that they put the names in the same order as candidates received votes in the primary election. However, it's far more likely that they used CCSA's billionaire backed candidates' existing information and then tacked on the other candidate information on as a grudging afterthought. The first clue that UWGLA has absolutely no respect for the candidates outside of the CCSA privatization pushers like Galatzan and Rodriguez? They misspelled the Honorable Bennett Kayser's name as "BENNET KAYSER" in every occurrence of both the image and text of the communication they sent out. This is the seated school board member, and UWGLA has a mind-blowing multi-million dollar budget, but they get everything else correct except the school board member's name? Moreover, notice how all of the head shots are proportional, but they use the old political trick of making one candidate look abnormal by using a disproportional photo crop. A nasty little Fox News style play probably drawn up by CCSA's arch-reactionary political director Carlos Marquez. We frequently look to UWGLA's plutocrat funding sources and the neoliberal pay-to-advocate paradigm that UWGLA and other members of the Non-Profit Industrial Complex (NPIC) operate under. Nothing is more telling of UWGLA's complete allegiance to the neoliberal corporate education reform agenda than this 2013 photo of privatizer Monica Garcia, the disgraced John Deasy, millionaire Casey Wasserman, billionaire Eli Broad, and UWGLA's Elise Buik. What we typically don't look at is the staff members UWGLA employs to promulgate their donors' agenda. UWGLA's current Education Program Officer is Elmer G. Roldan. Prior to his UWGLA stint, Roldan worked for the Camino Nuevo Corporate Charter Chain—known for its unelected board of bankers, finance capitalists, and hedge fund managers. Before cashing in on the charter industry, Roldan worked for former Los Angeles Unified School District (LAUSD) board member Monica Garcia, who has ties to the shadowy Gülenist cult. He also worked for the anti-public education NPIC Community Coalition. It's a safe bet that Roldan's whole two years of community college prepared him to deal with the broad range of topics on education policy and pedagogy. Until recently (namely when they were exposed for their role in UWGLA's massive public deception campaign) Roldan worked alongside Ryan Smith and Jason Mandell. Before joining UWGLA, Smith worked for the notorious Green Dot Corporate Charter Chain and the so-called Partnership for Los Angeles Schools (PLAS) with Marshall Tuck (whose wife, Mae Tuck, also works at UWGLA). After the UWGLA astroturf incident, Smith went to work for the reactionary EdTrust. Mandell worked with fellow poverty pimp Yolie Flores at the The Gates Foundation funded Communities for Teaching Excellence. Mandell now works for the California Charter Schools Association, although that was sort of his function when his paychecks read UWGLA as well. 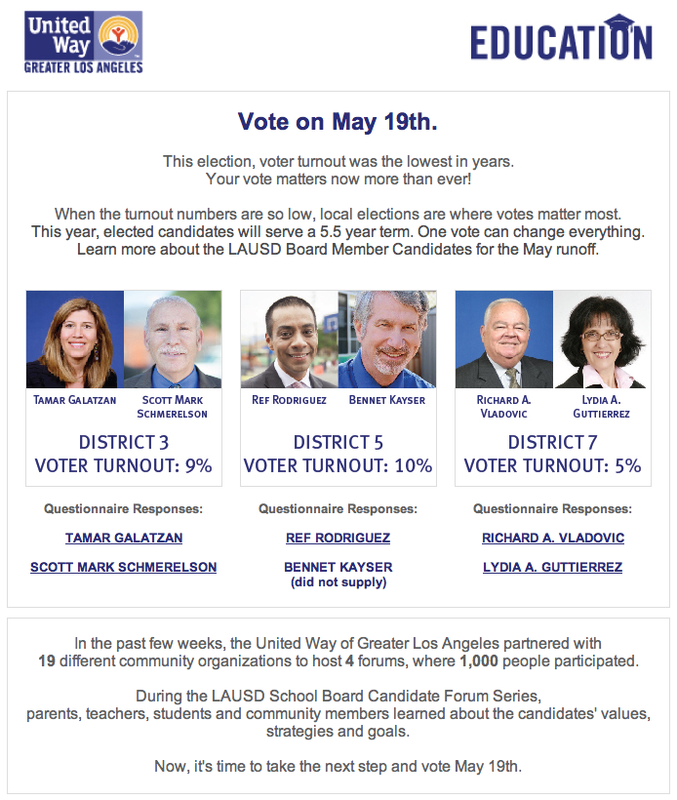 The candidate forums run by UWGLA mentioned in the mailer were addressed in Statement on Gates and Broad Foundation funded United Way Greater Los Angeles running LAUSD forums. Candidates opposing the CCSA funded ones had myriad complaints about the heavy handed manner in which the UWGLA treated them durring the forums. 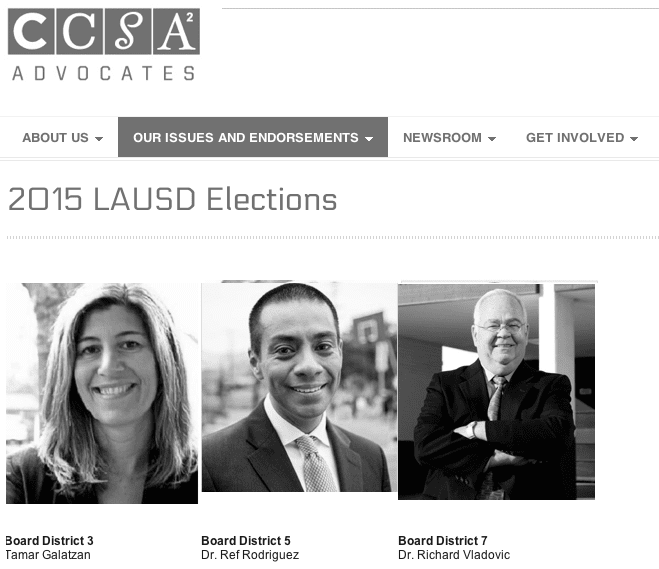 LAUSD District 3 candidate Carl J. Petersen submitted the following account. His complaints have been corroborated by other District 3 candidates, who wished to remain anonymous. The first thing that hit me upon entering the venue was Ms. Galatzan had set up a table in the courtyard with her election paraphernalia, including yard signs. This clearly broke the rules which stated that only one piece of literature could be distributed and this would be at a table that the United Way would set up for all of the participants. Elizabeth Badger and I both immediately complained to the person in charge (I believe that his name was Elmer), who confirmed that Ms. Galatzan had broken the rules and promised that it would be taken care of. When the signs remained up I filed another complaint and was again assured that the signs would be taken down. Once on stage, the moderator announced a rule that each candidate was allowed one sign in the courtyard. The fact that this was a rule change was not conveyed to the audience. The next inconsistency with the rules occurred during the debate itself. After a round that did not go well for Ms. Galatzan (I believe the subject was iPads), the moderator decided to break format and allowed Ms. Galatzan to go out of turn to defend herself. The moderator felt that this was fair because we had all attacked the incumbent. To me, the strangest part of the night happened when I went to collect my unused literature. I had provided 200 flyers to be distributed at the appointed table, but the actual turnout was much less. I think the estimated attendance was 100 people. My flyers must have been in great demand because none were left and the volunteers said that they had not seen them. I wish I knew when in the evening they had been removed. I think that it is telling that the United Way was the only candidate forum that Ms. Galatzan attended during the entire campaign. She skipped the second debate, a meet and greet at the Northridge West Neighborhood Council and a final Q&A at the Encino Neighborhood Council. I would like to know what assurances the United Way provided her that made her feel their event was a safe one for her. 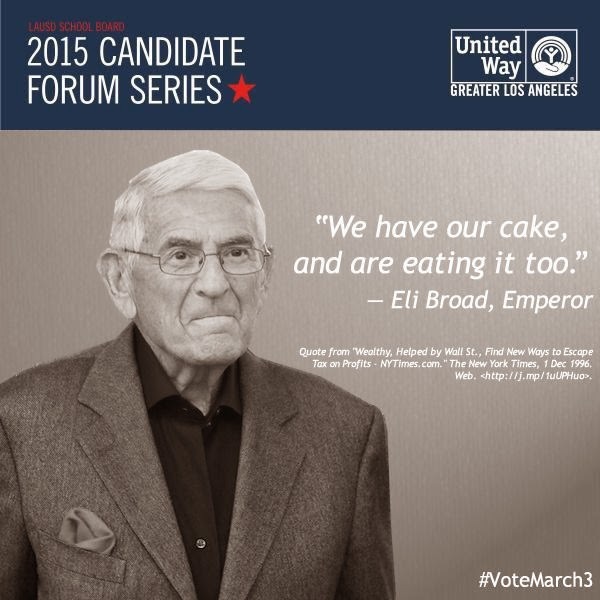 Eli Broad and Carrie Walton Penner will stop at nothing to turn the entire public education system over to the private sector, where corruption and greed rule supreme. UWGLA's ability to remain a tax exempt organization is testament to how much power and influence the Broad/Gates/Walton Triumvirate have.